Ian Chadwick is a Toronto-based freelance writer and editor, specializing in technical documentation and computer manuals. Resources Corp., comes to the Atari from the PC/MS-DOS world. Like many ports from the IBM environment, features have been trimmed from the original without any apparent additions to counter their loss. And, like so many other programs that make their way to this side of the computer world, ST users have to be satisfied with Version 1.0, since no upgrades are planned. On the IBM side, Drafix has gone to "plus" and "ultra" versions, the latest of which has links to spreadsheets, databases, word processors and desktop publishing programs. The ST version was designed to work as closely as possible to the MS-DOS version. As such, it's somewhat of a hybrid: It only makes full use of some of the ST's features. For example, you cannot access any desktop accessories from within Drafix. The program ignores GEM's relatively easy file selector, using its own custom file-selection routines. All function, help and undo keys are ignored (in the IBM version, the function keys work and can be altered). Menus don't drop in vertical bands; they lie across the screen horizontally, above the drawing area. While these are simple enough to learn and use, it's irritating, especially when GEM seems perfectly adequate for these functions. Designed for the professional IBM user, the ST version of Drafix sadly drops several of the more powerful commands and features, such as drawing splines and curves, all function key use, including macros, free-hand sketching, stretch individual points, floating text editor, modify font type, font width and text size, default drawing parameters, and copy items with a slant. The ST version has four fewer fonts than the PC version and no resource to design new fonts or information on how to create or port fonts from other applications. One can only assume that Foresight Resources Corp. does not believe ST-based professionals will need the same features IBM professionals use. The program comes with three manuals: an ST-specific introduction and installation guide (with considerable information about plotters), Getting Started (an overview and tutorial) and a Technical Reference Guide (all commands explained in menu order and detail). More recently, Foresight Resources has also bundled two separate packages with the main drawing program: Dot-plot, required to print your work on a dot-matrix printer, and General Symbols (a collection of 400 all-purpose drawing symbols). Three packages of professional symbol libraries are now available, for architectural, engineering and mechanical drafting. Learning to use Drafix requires a thorough reading of the manuals, including the tutorial. Many functions and features work in a convoluted process or perform in unexpected ways. For example, to merge a symbol from the disk to a drawing, you first must select a symbol library (File>Library>Open> Symbol library), then go to the draw menu to select the location of the symbol (Draw>Symbol> Select > From disk) and finally place the symbol on the drawing (Draw >Symbol> Enter). This is hardly an intuitive process. If you look in the index of the Technical Reference Guide, you will not find any indication of where this might be described (that is, you don't already know it's under Symbols, Drawing...). In the Getting Started manual, it's under Symbol, Inserting (a nine-step process, not including the choice of the symbol library). Although there is nothing inherently difficult in Drafix, the unexpected way in which a feature executes may come as a surprise to the user who has not fully read the tutorial. The lack of a simple Undo for features such as modify-stretch and copy > move may well have you pulling your hair out in short order. Without rulers, it's often difficult to position an end-point or object as precisely as one might wish. The best advice while creating any serious drawing is to save often, after every element, to avoid nasty surprises. There is no simple "clear screen" command. The "erase all" command removes items, one at a time, apparently in the order they were drawn—a potentially slow process if your drawing is large and complex. I found it easier to save a blank drawing and load it over an existing drawing, rather than wait for a full screen to erase. No technical information on the file structure is provided, so you can't write your own utilities to link with Drafix. This tends to leave Drafix by itself at a time when programs like CAD-3D/Cyber-Control and DynaCADD are offering programmers the ability to mesh their output in other applications. The 500 + pages of written material that accompany the program are not always as clear and concise (or informative) as they could be and can be best described as "adequate." There are no keyboard alternatives or macros to simplify any process, but the most recently selected menu remains "down," so you avoid having to recall menus for common tasks. If, however, you have to switch menus, this structure is tedious and time-consuming. Sometimes the return key works with input; often it doesn't. The mouse is the only method for commands in most cases. You have no real control over the color on an SC1224 monitor. There are four choices: blue, red, black and white (and no access to the control panel). However, Drafix is configured so that you can change colors of the menus, background, grid and prompts, but in such a way that you make the data, lines or menu names vanish! Sometimes, these changes don't have any affect until you perform a subsequent action, such as loading a new file. 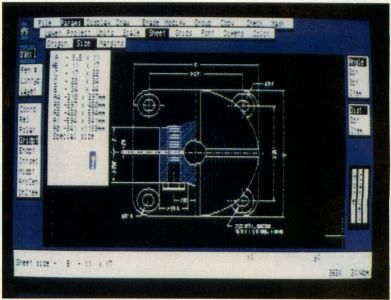 Since the resolution of a color monitor is not very good for CAD work, a monochrome display is highly recommended. Despite the missing commands and the awkward interface, Drafix still has more features on its side than most of the competition. 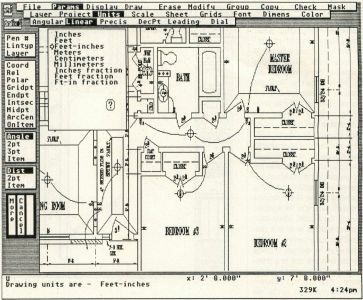 It has a wealth of functions and utilities, including grids (on/off/lock, variable size), flexible line, polygon, ellipse, arc and circle drawing features, move, copy or modify items or groups, item or group rotation and alignment, stretch a region, trim lines, bevel, round and fillet a corner, hollow or filled objects, symbols (save, insert, delete, change, explode), text (multiple fonts, at any angle), dimensioning, checking (size, angle, area, distance, symbol name) and masking (selectively viewing objects or symbols). Eight views can be saved for later recall. Zoom uses an easy, dynamic method for specifying the area to zoom into or out of (although there is no means to enter an exact zoom value such as 150%). You can follow a path of zoomed views by clicking on "last," panning a view (again dynamically, without any exact control) or seeing the drawing in a full-screen mode. Drafix supports multiple sheet size and a wide variety of plotters and dot-matrix printers. It even saves the workscreen as a DEGAS-format file, although annoyingly with a .PIC extension (you'll have to rename it to .PI2 or .PI3 from the desktop). 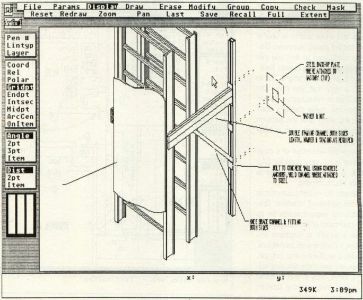 Drafix also fares well in its speed of execution and when redrawing the screen, although large and complex drawings take a while, especially those with text. During the time I worked on this review, Drafix proved stable and bug-free. The only times it didn't perform as expected were when I made assumptions as to a function's executions (based on my prior experience with other CAD programs) without reading the manual's explanations first. Finally, the most recent release of the program comes with a utility to translate files between the IBM and ST worlds. Overall, Drafix could be a great program. It stands up well against FirstCADD and Master CAD. It has lots of guts inside, but is crippled by what appears to be the company's lackadaisical approach to the ST market. It has an unfinished feel about it—which is about as good as it's going to get without updates or upgrades. Professionals who wish to use the ST as an inexpensive CAD alternative to high-end PC-based systems will find Drafix on the ST a disappointment compared to the PC versions. ST users themselves will feel frustrated and annoyed by Drafix's interface and lack of standard GEM features. In my opinion, ST Drafix needs a serious re-think and an overhaul to bring it up to par with the PC version. It should also be made to conform to existing ST standards and make better use of inherent resources, such as GEM. The manual should be improved and enhanced to include proper technical information. Until Foresight Resources Corp. decides to support the ST market fully and bring out a properly redesigned and upgraded version, Drafix runs a distant second to ISD's DynaCADD as the professional choice for CAD.